When I started my blog, I was aiming to make a site to help parents at home with preschoolers, have fun things to do with their children. I hope I haven't strayed from that. 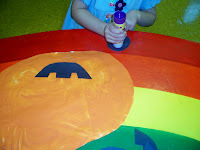 I started sharing my preschool days, feeling that most of my projects are easy enough to do at home with children too. I love being able to share all these great things I do, but if any parent has felt that I have strayed away because I am writing about the school, please know I am still thinking of you and trying to post so that anyone can follow the ideas. 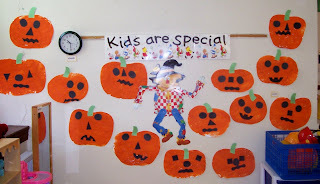 This week we began Halloween at school. I love decorating for Halloween. Maybe it's the colors, I don't know, but I just think everything looks so fun and happy and full of life. Before I begin, you have to check out the great spiderwebs and spiders over at Raising Creative and Curious Kids--they are great. Kids love glitter(I love glitter)! We began this week with fingerpainting. I told my aid--"You know I'm trying to be a good teacher when I do fingerpainting." No matter how hard I try, I can't keep that paint from getting everywhere. I now have a new pair of pants with orange all over them:). We were d iscussing the aspect of taking a pumpkin, adding a face and it becoming a jack-o-lantern. So on Tuesday we did the fingerpainting. Fingerpainting is an activity that is new to a lot of the children. Many of them step up to the paper and look at you like--"You want me to what!" I had one little boy this year who kept telling me, "No, my mom says I can't touch paint." It took him a good 5-10 minutes before he even stuck a finger in it. On the flip side you have some that dig those hands in and we end up with a whole painted tab le. 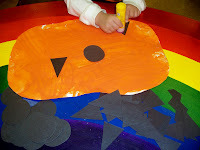 Fingerpainting is good sensory activity though, it's always good to let children experience these kinds of activities. Then on Thursday I introduced shapes, triangle, square, and circle--along with silly mouths. The children were allowed to choose the shapes they wanted and turn their pumpkin into a jack-o-lantern. These really brighten up the room. 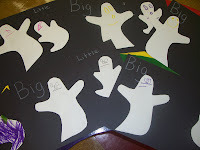 The other concept we touched on was BIG and little, I used ghosts for this activity. This can be done with so many things, anywhere, anytime. What I did was to write the word BIG largely on one side of the paper, and then the word little tiny on the other side. 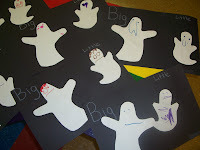 The children then had to place the ghosts on the correct side of the paper. They did well with this. We are also practicing lots of Halloween songs. Our school has a Halloween Parade at the end of the month and we always entertain our visitors with a little "show." We have six days to learn six new songs and fingerplays. Wish us luck. With this class though--they are quite the showmen. 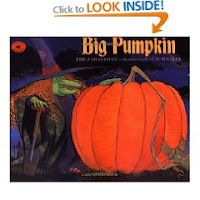 A favorite book of mine is "Big Pumpkin," by Erica Silverman, illustradted by S.D. Schnidler. I sometimes have to be careful, because I'm not sure my sense of humor is the same as others. But, I have been reading this book to the children for the last 3 or 4 years and they find it hilarious. The book is about a witch that planted a pumpkin and now wants to bring it in to make pumpkin pie. The pumpkin is so big she can't get it "off the vine." So lots of friends come to help her. It has repetitive text that children can join in with too. Fun book.